For many years, I smudged my house like mad on a regular basis, torching out white sage sticks and setting off many a smoke alarm. I have six children and even though they are now adults, they still mello w out as soon as they smell sage. I conditioned them well. Until I furthered my training, I never thought about spiritually cleaning my home any further than the air I breathed. My house was (usually) clean to look at, but I did not go to any heroic measures on a sacred level. Once I “grew up” as a magical person, I learned that just like cigarette smoke, negativity can seep into the walls of your home and hang out there, causing all the smudging with smoke in the world to be less effective. Every now and then, you have to spiritually clean the physical structure of your home as well. That is where we break out the 4 Thieves Vinegar. The legend of 4 Thieves Vinegar goes all the way back to the early 1600s in Europe when doctors wore beak-faced masks and the plague ravaged the country. The town of Toulouse was hard it and four robbers, who were perfumers by day, went through the houses of the dead and dying and looted, taking whatever they wished. They walked fearlessly through the bodies, plundering both homes and businesses. At last, they were caught and the judge offered that if they would give up their secret that kept them immune from the plague, he would grant them a full pardon. They did and it was ever after called 4 Thieves Vinegar. How is 4 Thieves Vinegar made? Tradition also dictates that four herbs, called “the thieves,” are added to a base of red wine vinegar. Most Conjure recipes develop with the idea of using what is available in one’s own cupboard. Substitutions are not only acceptable, but are expected and a long list of possible “thieves” is included. Four are chosen and the only absolute is that one must be a full clove of garlic or, if you use a small bottle (under two ounces), a half clove freshly cut. I have my own favorite thieves that seem to create the best mix and that is the combination that I bottle and sell in my shop. 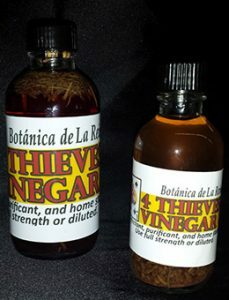 How do I use 4 Thieves Vinegar? Pour a stream of 4 Thieves Vinegar in the shape of a cross (solar cross for 4 elements or Christian cross for Christ’s blessings) onto a new, unused sponge. Use it to wipe down surfaces such as door jambs, thresholds, doors, cabinets, and shelves. You can even put a tablespoon into your mop water to mop floors. As you wipe the surface, envision that you are disinfecting and banishing all evil, negativity, obstruction, and interference from the area. For best results, follow with Chinese Wash. You can use the same sponge for Chinese Wash as you used for 4 Thieves Vinegar and you can wet the same sponge and use it again next time provided you did not use the sponge for any other purpose in the interim.